I had an entire week of silliness planned for my blog (because often what I post is just plain silly) after taking last week off to spend quality time with my husband after not laying eyes on him for 54 days. Humour is what gets me through the darkest patches of my life, when my throat constricts from the pain of remembering I've lost a child or when life seems too overwhelming from raising a medically fragile disabled child, or from simply wanting to lose my mind from parenting three children by myself. A dumb joke, even one written by me, helps lift the heaviness of life from my shoulders. But I can't find the funny today. It evaporated into the sky filled with smoke as my province is ablaze with forest fires. 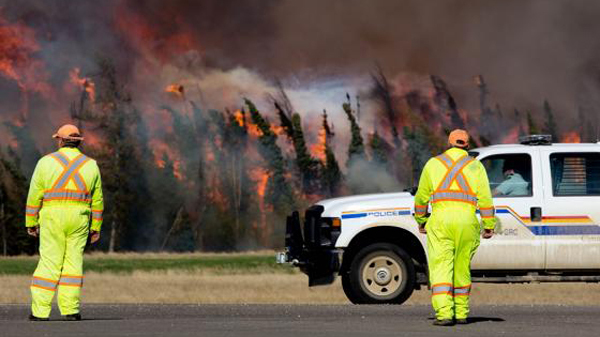 As of this morning there were 116 forest fires in Alberta, with 34 of them raging out of control. An entire town was destroyed when an out of control blaze split in two, circled the town and burned everything in it's path, destroying most of it's infrastructure. Not too far away, thousands of oil workers were evacuated from their temporary camps due to another blaze threatening to swallow everything in its path. My husband said the sky outside his window looks like a tribute to Halloween, all orange and black. Natural disasters threaten human life almost every day. Japan, America, Canada and every other country on the planet at some time or another sees tornados, flooding, drought, tsunamis, fire, ice storms and everything else Mother Nature can think to throw at us. Those of us who are lucky are insulated from it, safe in our homes as we watch with horror the images flashing across our television screens, thankful it's not us being evacuated or endangered due to disasters. But this disaster, these fires, they are touching my life. Directly and indirectly. While my home, where my children and I reside is far from the path of the flames and safely out of danger, my friends' homes aren't so lucky. My readers' homes aren't so lucky. Relatives of mine have lost everything. 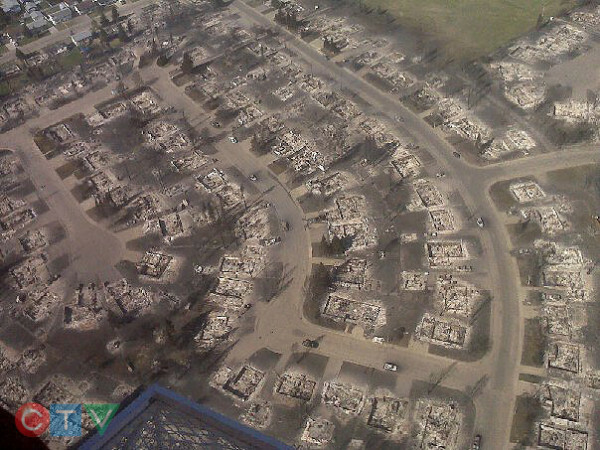 An entire town incinerated within hours, with no warning because the wind carried the flames at 100 kilometers an hour. It could have been my house. So I'm taking this moment to think of the people who are affected by natural disasters everywhere, not just here in Alberta, but elsewhere too and I'm remembering how lucky I am when so many others are not. Tomorrow I'll be silly. Today I'm too heartsick to find the funny.